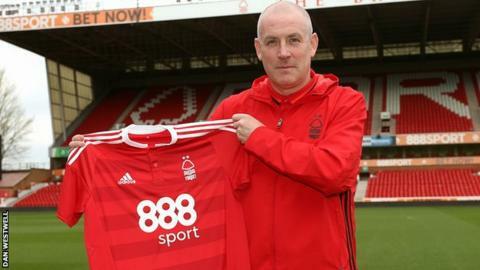 Mark Warburton says the stature of Nottingham Forest and the potential at the club means becoming the 26th man to take charge since Brian Clough left in 1993 is a risk worth taking. The ex-Rangers manager is the 10th appointment made by owner Fawaz Al Hasawi in less than five years. Forest are just two points clear of the Championship relegation zone. "The size, quality, expectation and tradition of the club must excite you," Warburton told BBC Nottingham Sport. "I know there is a job to be done but there is no doubt about the potential here. Our job is to add some stability." Warburton, 54, who has been out of work since leaving Rangers on 10 February, insisted he was "comfortable" with the assurances he has been given by the owners at the City Ground despite the ongoing upheaval. Al Hasawi has twice tried to sell the club since last summer, but Warburton said he was not put off by the uncertainty and owner's reputation for sacking managers. "You take everything into consideration," he added. "It's a pleasure and privilege to be here. "You have to take risks; you can't always play safe - far from it. I'm confident we are moving forward and we have the support from the board we need to have." Warburton is eager to see Gary Brazil, who had been in interim charge, remain at the club. Academy director Brazil and academy coach Jack Lester have both mulling over offers to revert to their roles with the youth set-up, which has seen players like Ben Brereton, Matty Cash, Ben Osborn, Joe Worrall and Oliver Burke progress into the first team. Warburton met Brazil and Lester on Thursday morning and was "hopeful" they would stay on. "They have done tremendous work in the academy," Warburton added. "Academies exist to get players into the first-team squad and you look at the first-team squad and they have done a very good job. There is no doubt about that. "They stepped into a difficult role and I am full of respect for the work they did. "I had a good chat with them this morning after meeting them for the first time. I look forward to them hopefully continuing the work in the academy. I was delighted with the chat. The quality of the work was there for all to see." Warburton was thrilled to have a familiar face in such an "important" role. "I have known Frank very well over a number of years," Warburton said. "I have watched him work, have watched the quality of his work, the quality of his recruitment, his eye for a player and his knowledge of football clubs so I am full of respect for him. "He is an outstanding individual - one of the best in the business. "Frank coming in early gave us a real insight into where the club was, the players and the staff. That really helped us. It was a very swift decision, but was helped by the fact Frank was here first." Forest are 19th in the Championship, having lost five of their past seven matches, and face fierce local rivals Derby County at home on Saturday. The Rams also have a new manager in charge, meaning it will be the fifth consecutive East Midlands derby with a different manager in charge of both clubs. Warburton said: "These are the games players must relish and understand the emotions and passion that is involved. We know exactly what it means to supporters. It is a huge game for a number of reasons. "I understand the significance of this game, what it means to people in the area. It is important for the players to get the balance right. "You have to go out and perform and enjoy the pressure. But they must understand what the game means to people." Warburton said his immediate priority was ensuring survival in the second tier of English football. But he is already thinking further afield. "We have to get the club back to where it needs to be in the short, medium and long term," he said. "We need to stay in the division. We have to steady the ship, get the performances in and the points we require on the board then then we need a solid pre-season to try to fine-tune the squad and add quality in key areas. "The Premier League is the promised land and that is where we have to get to. A club of this stature has to be in the Premier League. That has to be a very clear and realistic ambition." How will Warburton make his mark? Warburton brings a very specific ethos about football and how it should be played. To some extent that was welcomed at Rangers especially as he won the Championship in his first season - the second tier in Scotland. He won that at a canter playing some very attractive football. Rangers played this short passing game and scored a lot of goals. It was very effective and he made a lot of good signings at that level and they were promoted without any fuss whatsoever. The downside of that particular brand of football was that Warburton always said Plan B for me is to do Plan A better. What happened then was when their opponents began to learn how to combat that style of play he wouldn't then knock it long and try a more direct style, which is commendable in some respects. Stubborn or principled and stylish? Mark Warburton wouldn't compromise his ethos but ultimately that began to cost him results, especially when he moved up to the the Premiership when they were were coming up against better teams and better organised defences and Rangers found it much more difficult to score this season. I guess that is one of the factors that ultimately cost him his job. Ultimately it will come down to results and can he keep Nottingham Forest up? It did seem initially he was on to a good thing and Rangers fans really bought into what he was trying to achieve. But things turned sour and some fans turned things like always making substitutions on the hour mark. He has his own way of doing things and will not relish being moved away from that. Can Warburton be a success at Rangers? Read more on Can Mark Warburton translate Brentford success to Rangers?